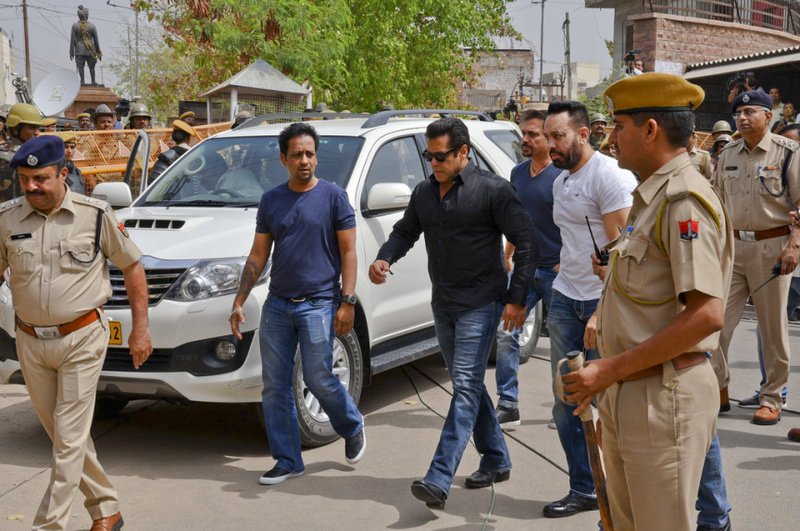 NEW DELHI (AP) — Bollywood superstar Salman Khan was convicted Thursday of poaching rare deer in a wildlife preserve two decades ago and sentenced to five years in prison, with the judge describing him as a "habitual offender." The heavily muscled actor contended he did not shoot the two blackbuck deer in the western India preserve in 1998. He was acquitted in related cases. Khan was in court for the ruling in the western city of Jodhpur. Police took him to a local prison after the verdict, though he is likely to be freed on bail in the next few days. Police said additional security had been ordered for his prison ward. "He has filed an appeal and the appellate court will decide whether they will hear the appeal tomorrow or at another date," prosecutor Bhawani Singh Bhati told reporters. Khan, 52, has starred in more than 90 Hindi-language films, but has also long had a reputation as a Bollywood bad boy, known for his run-ins with the law — including a fatal car accident — and his troubled relationships with women. His relation with actress Aishwarya Rai in the early 2000s reportedly included him beating his hands bloody as he pounded on her apartment door during an argument. "If you won't fight, that means there is no love between you," he later said in an interview. "When we fight, it is all because of our love." He starred with Rai in the 1999 hit "Hum Dil De Chuke Sanam." Other hits included "Sultan," ''Ek Tha Tiger," and last year's "Tiger Zinda Hai." He spent a total of 18 days in prison in 1998, 2006 and 2007 in the poaching cases, but was freed on bail, the Press Trust of India news agency said. He had been sentenced to prison terms of between one and five years in related cases before being acquitted by appeals courts for lack of evidence. Bollywood quickly rallied to Khan's defense. "My heart goes out to" Khan, the actor Arjun Rampal said on Twitter. "I feel this is too harsh." Khatri in his ruling called Khan a "habitual offender," the Economic Times newspaper said. The Bishnoi, a religious sect whose beliefs include worshipping nature and wildlife, and who have long protected the blackbuck deer, expressed disappointment at the acquittal of the four actors. Chogaram Bishnoi, a member of the community, told reporters that he had seen Khan stopping his jeep and shooting the two blackbucks in a village near Jodhpur in October 1998. Khan and the other actors were in the area at the time filming a movie. Khan has faced other charges in the past. In 2014, the Mumbai High Court acquitted Khan in a drunken-driving, hit-and-run case, after he was accused of running over five men sleeping on a sidewalk in 2002, killing one of them. The government of Maharashtra state has challenged his acquittal in the Supreme Court.